The talented sculptor was part of a team that made a public monument for Sonoma County Regional Parks in California. Every journey begins with a first step. For American-Saudi sculptor Faisal Alahmad that step was taken when he decided to travel to the US to continue his education. Before finding his true calling in San Francisco, where he pursued a Bachelor of Fine Arts in Sculpture from the Academy of Art University, his academic journey took him on several different paths. The Oakland-based sculptor’s entrance into the world of fine arts came after what Alahmad refers to as a “long search for purpose at 18.” He believed that people must have a nine to five job, “which would then allow them to follow their passions during their own time,” Alahmad explained. His first choice was to pursue a degree in Computer Science to become a programmer and thus pave the way for a full-time office job. The intense mathematical aspect of the subject proved to be daunting and Alahmad’s interest faltered. Next, he found himself taking a new path to becoming a writer. Although he strived to perfect his writing talents for a few years and found success with some published poems, once more, writing was not his true calling. However, the year 2011 brought Alahmad closer to his path when he joined his brother in California to explore his passion for art. 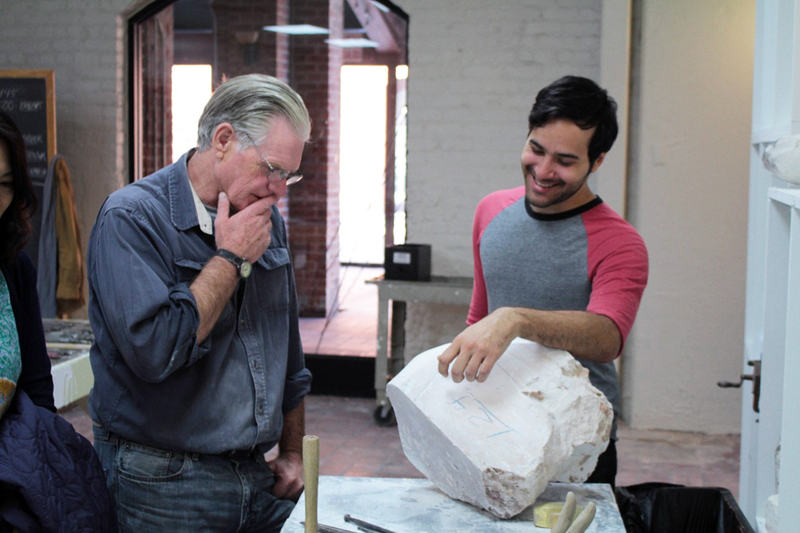 After several years of training and attending the Academy of Art University, he participated in the academy’s respected and prestigious Spring Show and won an award of excellence for his life-sized classical sculpture. Becoming a student was a turning point and shed a light on what fulfilled him. “I could focus on my craft in a serious manner that did not leave me feeling as if I was wasting time. I could start respecting myself as I saw others value my work,” he said. “It was like a door to a different dimension.” Inspired by the natural world as well as the scientific one and other sculptors, Alahmad had found his niche. His work has now been exhibited in California, Washington and Alkhobar, where he was born, and has been featured in newspapers in Saudi Arabia. Your bio mentioned a lack of enthusiasm when you were younger that was probably due to the environment at the time. Can you elaborate on this? When I said lack of enthusiasm, I meant that nobody in my milieu took art seriously. It was merely something to pass the time or to give the children a distraction. When I went outside the house into the public, I did not witness great art to inspire me. I did see some abstract work along the beachfronts and corniches, but those never appealed to me, though I do appreciate them when done beautifully. I wanted a narrative that was not entirely vague and demure, but something bold and honest, striking at the core of your values and beliefs. I wanted to make art that shook you and made you think beyond the few seconds that you admired or loathed it. School was another problematic area in terms of enthusiasm. Art classes were generally not taken seriously and they did not affect your grade overall, though I did enjoy them more than any other class period. ‘It’s good if you have any talent, but do not expect to grow as an artist,’ was the message I felt was conveyed. The art teachers were passionate to a degree, but the real problem was with the teachers of other subjects. I remember bringing clay with me to school one day and one of the religion teachers noticed me playing with it during an exam. It would have been OK if he had just told me to put it away, but he took it and threw it in the trash. He then pointed to a frame on the wall with Allah’s name on it and said, ‘Everything you do in life must be for Allah, what is this clay going to do for Him?’ I sat there silent and demoralised. There had to be an answer to that question, I thought, but I could not find it while in Saudi Arabia. In contrast, one of my other early memories was of travelling to France as a child. There, I saw art everywhere! And not just in the main cities like Paris, but in the small towns in between. I went to one such town and they had figure sculptures on the tops of buildings and inside shops, they left a lasting impression on me. What was missing in Saudi Arabia was a culture of art appreciation and acceptance of alternative genres, such as figurative work. When did you first realise you were an artist? Are people born with a gift like that? There are many talented children, but the ones who practise, who have a supportive community, are those who are destined to be geniuses. Even those without the genetic and environmental predilection to being artistic can become artists if they choose to learn the objective framework that art has in terms of shapes, lines, planes, proportions and other principles one comprehends through practise or tutelage. However, without passion, wonder, and awe, learning becomes dry and forced, regardless of the subject or craft. To gain those, you must be awash with inspiration, for you are a product of your environment. What draws you so much to science that you were motivated to create “The Scientist” series? In my lifetime, I have seen tremendous leaps of technology and scientific research. There is so much to learn about the universe but it is difficult to understand the science behind it in many cases. What fascinates me about certain scientists is their willingness to extend their understanding of their fields to the public in accessible, sometimes imaginative, ways. They view the world as it really is because they devised experiments to make sure what they believe is actually real. In that sense, reality is weirder than fiction, and that is where all great stories start, at the precipice of the unknown reality. You talk about having a fascination with hands, please elaborate. If I want to understand people, I look at their hands rather than their eyes. Hands are agents of our will, but they also seem to have their own personalities and mindsets. Sometimes I feel they reveal the true nature of others and myself. They impart a certain energy that imprints itself onto my work. It is one reason I believe original art work is valued so much, to know the artists’ hopes and dreams, failures and successes and everything else is weaved from their souls, through their fingertips, into the material of the art. How supportive has your family been throughout your journey? My family has been a major component in helping me grow as an artist. It helped that my siblings were also artistically inclined so I was surrounded at home by their art, especially my brother Yusef’s. They didn’t necessarily tell me I should become an artist as a career path, but they actively encouraged me to read as many books as I could, write stories and pursue my passions, be it with sculpture or computers. My family has always supported me and for that I’m eternally grateful. They truly believed in me and helped me even when I made mistakes and stumbled along the way.